Over my copywriting years, many of same questions keep popping back. What is exactly is a copywriter? Do I need a translator or a copywriter? 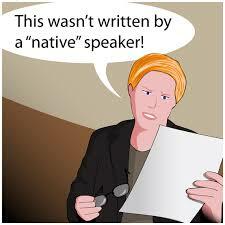 Is it worth paying a professional when we have native English speakers in house? Does it really matter if my English copywriter isn’t a native speaker? This last one never fails to surprise me. So, when just last week yet another potential client let slip the dreaded words, I decided to take action. The result? A complete answer to this niggling question based on some of the different arguments I’ve encountered over the years. This whole question hinges on the assumption that when you learn a language, you can achieve the same level of understanding, subtlety, nuances and creativity as a native speaker who has been immersed and educated in the language all their life. And, I would argue that, bar true bilinguals (and even this is rare as one language usually dominates), this is nearly impossible. Don’t get me wrong, people can learn to speak another language very fluently and write without making any grammar mistakes. But, the style and syntax will nearly always give the game away – I’ve read a lot of English texts written by non-natives and I haven’t yet been fooled. Your customers won’t be either. There’ll always be telltale signs! Yes, it is true that increasingly English content targets non-native audiences across the globe. Yes, this kind of “globlish” does require simpler vocabulary and less wordplay. But, no, don’t be tempted to accept second best and lower the quality (and impact) of your message. This was the argument put forward by my new prospect. He had a tight budget and was hesitating between me and an inexpensive English copywriter, who was in fact French and had only spent several months in London as a student. I tried to explain that this difference in price was precisely because the non-native copywriter could not offer the same quality and was forced to lower their price to fish for work. I’m not going to lie to you. Yes, there may be a big price difference. But, without trying to sound too clichéd, you really do pay for what you get. Obviously for small companies and startup price is essential, but in the long-term, well-written, professional copy will reap its own rewards both in terms of new customers and brand image. Another client was convinced that the most efficient solution to writing guided tour descriptions in both French and English was to use the same person. Despite my protests to the contrary, this client believed that the convenience of using one person who knew the products well far outweighed the importance of high-quality content. The result? Compelling content in one language; mostly correct translations in the other. It’s worth remembering that each culture (and language) has its own patterns, references and specific features, which are difficult for a non-native to fully nuance and understand. Another reason for choosing a non-native copywriter is that native ones (the real, authentic versions who’ve been born and bred in an English-speaking country) are hard to find. In Paris, you’ll only find a handful of native English copywriters, but, it is worth the time, effort and investment to find the right writer for your project. Do you agree, disagree or have another point of view? And, if need powerful (native) English copy – copywriting, translating, or transcreation – don’t hesitate to get in touch.